Looking for a fun and tasty new cauliflower recipe? Try these Cauliflower Steaks with Creamy Siracha Aoili…they are AMAZING. I could not stop eating them! The mild flavor of the cauliflower is kicked up a notch with a creamy siracha aioli that takes just minutes to make. And each serving is just 1 Point making this an excellent Weight Watchers side dish recipe that looks beautiful and is quite nutritious. 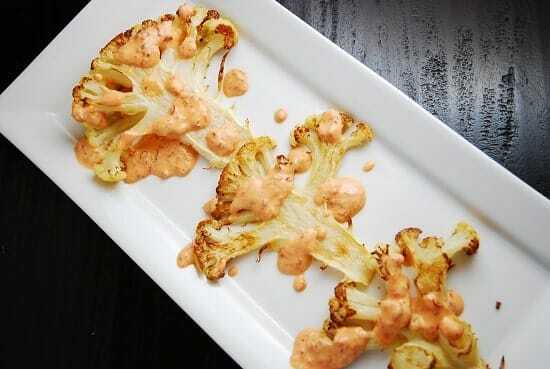 So if you are in need of a new way to add some zing to your veggies, give this Cauliflower Steaks with Creamy Siracha Aoili Recipe a try.You might be surprised at how many vegetables you are willing to consume with such an amazing sauce topping them. Enjoy! What a delicious and unique new way to prepare cauliflower! Slicing the head of the cauliflower, instead of breaking it into florets offers a beautiful presentation, while the creamy siracha aioli gives the mild cauliflower an intense boost of flavor. Line a large baking sheet with parchment paper or aluminum foil, ad mist with non-fat cooking spray. Place cauliflower “steaks” on baking sheet and lightly mist with olive oil mister. Sprinkle evenly with salt. Place in oven and cook until cauliflower is tender and begins to brown on edges, about 15-20 minutes. Meanwhile, in a small bowl combine remaining ingredients in a small bowl. When cauliflower is ready, remove from oven, place on serving platter, and drizzle with the siracha aioli. Serve immediately. Easy to make. Too salty- neat time I will use 1/2 tsp salt. Otherwise, it was good. Do you have a substitution recommendation for the siracha sauce if I don’t like things too spicy? You could try a mild salsa instead. Delicious! Ill never make cauliflower the old fashioned way again! Thank you for sharing this recipe. So so so good! I was worried that it would be too salty with a full tsp but it was perfect. Love this recipe. Thank you! I tried this last night! It was SOOOO good! I LOVE this idea! Why did I never think of a Sriracha aioli sauce? I cannot wait to try this one out.